Log Cabin Fire Treatment – Does this costly process affect you? Log cabin fire treatment is one of those areas which isn’t widely known about and most people wrongly assume it will have little impact on their log cabin project. Whilst, if your log cabin is being built in a country which has relaxed fire regulations there will be little impact, in other stricter countries (like the UK), the impact can be very significant! The treatment of hundreds of square metres of timber can be very expensive and may influence your choice of materials in the first place! Of course you also want to ensure your log cabin is also well protected in a fire, even though timber retains its’ structural integrity very well in intense heat. Why is log cabin fire treatment so expensive? 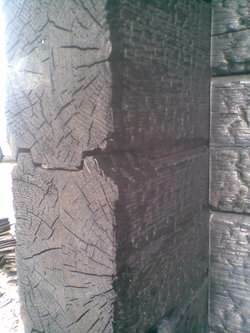 For log cabin fire treatment, in countries which require it, normally it is the internal surface spread of flame on timber which is being controlled. As log cabins internally are mainly all wood, this becomes a major consideration. If your log cabin is 2 storey this becomes even more of an issue, a the fire protection between one floor and another i.e. downstairs to upstairs, has to be able to withstand longer in a fire. As the materials needed to be applied to achieve fire resistance are very expensive, hence the overall budget can soon be adversely affected! In some cases where a log cabin is being built very close to another building, external fire treatment may be required. In most countries this is not required and usually most log cabins are built out in the country with plenty of space around them, so this is not an issue. However if you are planning to build near another building it pays to investigate this first. As with all building codes or regulations, to be on the safe side, contact your local authority building department and double check what log cabin fire treatment requirements are, where you are building your log cabin. Remember that there are different classes of fire treatment, so always know which one you need, (as costs vary wildy). 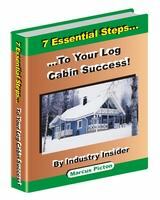 There are 2 main ways of achieving the required standard of log cabin fire treatment. One is to put all the timber (which is required to be treated) through an industrial process, which involves it placed in a large sealed chamber in a vacuum, whilst the liquid fire treatment material impregnates this timber. The timber is then removed, separated and allowed to dry back to normal moisture content. The second method is intrumescent surface coating, which is a fire retardant material that is painted on after construction. The latter usually consists of 2 or 3 coats (base and top coats are different), which results in a translucent varnish like finish (you can also get coloured opaque finishes if you wish). The former impregnates into the wood and then the timber is finished with normal varnish or paint. 1) Getting the machined timber impregnated with fire treatment using a 2 part vacuum and drying process. This ensures all the timber is treated throughout and this should not require retreating again. The timber will still require a water based varnish to provide the protection to the surface of the timber and it’s finished appearance. All the timber has to be treated so the off cuts are wasted. 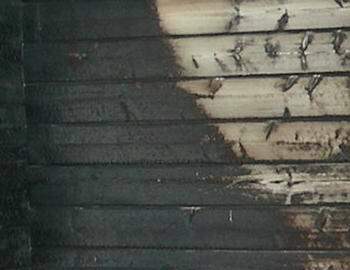 2) Use 2/3 coat intrumescent fire treatment to finish and protect wood. Only the exposed surface is treated and officially it should get redone periodically. Only treat the timber once installed, means less waste. Less lead time needed as timber doesn’t need to go through plant (3-4 weeks). No need to ship materials to treatment plant and get repackaged. Officially needs to be re-applied at periodic intervals to conform. Takes longer to finish on site. Which log cabin fire treatment is best? The answer to this question is difficult and the simple one is that it depends on your individual situation. The cost does vary, but by and large, when you compare the complete overall process, the costs are in very general terms comparable. What will partly help to dictate this, is the thickness of the timber you are using. The thicker the timber sections are, the more volume of wood you will have and therefore the vacuum impregnation process will be more costly. 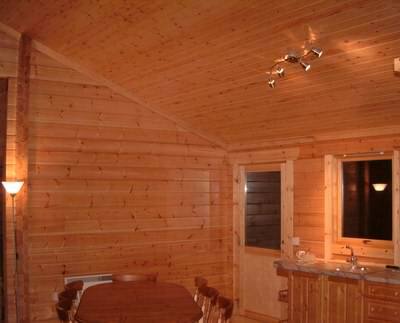 For the same size log cabin with thicker timber, using the intrumescent surface fire treatment method, the surface area will remain the same, so the costs will too! It therefore pays to investigate all the costs, before coming to a decision. Don’t forget the cost of applying any surface treatment on site. Intrumescent treatments often require more coats on site, which can cost quite a bit. In terms of the overall treatment, both should do the job, although officially intrumescent coatings should be re-applied after a number of years to comply with the fire regulations. I have never heard of anyone being required to do this, but for peace of mind the vacuum process shouldn’t require this. The vacuum process also should eliminate the milky finish which can appear in intrumescent treatments in wet areas like bathrooms or kitchens. However as labour is a large element, if you saving money on the painting process, then intrumescent could be cheaper overall. If, due to the log cabin fire treatment (you require to be done to comply with the local building code), the costs are now much higher than you anticipated, then you may wish to consider the use of other materials which are fire resistant. Stone and ceramics are obviously much more resistant to fire and these can be used to good effect in a log cabin. However they are not cheap and as such will probably be used sparingly and in the most appropriate locations. By far and away the cheapest material which is fire resistant is plasterboard. While you may not have considered this option before, perhaps now you can see why some people have chosen to go down this route for some areas of their log cabin. In fact on certain projects using plasterboard underneath timber boarding, was still more cost effective than using the very thick timber and fire treatment, which would be required to comply.